Lumberjack guesthouse "Yolki-Palki" is located in old wood workers village Oktyabrsky - 35 km from Kirovsk city close to Khibiny and Lovozero Tundra and surrounded by forest. The house is used by guests for family or holiday celebrations, or just for staying far from the civilization noise. Sleeping in this wooden house is deep and quiet. On the attic lives a squirrel family. In this program the hostel is your base for a multi activity program with cross-country skiing, alpine skiing in Kirovsk, ice fishing, snowmobiling and excursions in interesting Russian cities. Day 1: Arrival to Murmansk airport. Transfer to the Lumberjack guesthouse "Yolki-Palki". Sauna. Day 2: You can hike or ski in the village and in neighbourhood forests, to get familiar with the environment and have snow fun sledging down from a snow hill or to make dolls of snow. In the evening – shaslyk party outside around a fire (optional). Sauna. Day 3: We offer a whole day skiing tour through frozen winter forests with campfire lunch (optional). In evening sauna. Day 4: We offer take skies with us and drive by our off-road bus to a frozen lake for trying luck in ice fishing (optional). Those who are fond of skiing can ski in neighbourhood. In evening sauna. Day 5: We offer a snowmobile safari through forest, and over frozen lakes and rivers (optional). Those who are not familiar with operating snowmobiles will get instructions. Campfire lunch in a Saami Sot House. 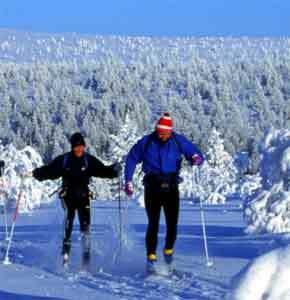 Day 6: We offer a trip to Kirovsk city for Downhill skiing and excursions (optional). Kirovsk is the major downhill skiing centre in the Northwest of Russia. The town is located in a valley of Vudyavr Lake and surrounded by Khibiny Mountains. Lifts on alpine slopes works from 10.00 to 18.00. There are Alpine slopes inside of the city but the most attractable and comfortable one is located out of city and easy reachable by car. Amount of lifts you can choose by yourself. Dinner in a Bowling Centre with possibility to play bowling (optional). Day 7: Departure. Transfer to the airport. Prices on request. Click >>info@kolatravel.com for an offer! Breakfast: EUR 10,-- pp, lunch: EUR 12,-- pp, dinner: EUR 15,-- pp. √ EUR 150,-- for snowmobile safari to Saami Sot House in Inga village (100 km in total) incl. lunch around camp fire in the Saami Sot House.